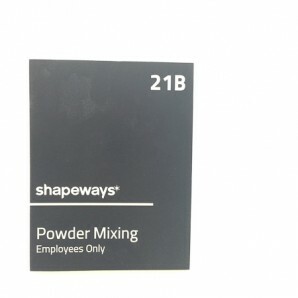 a visit to Shapeways NY factory! Last week, Jesse and I visited the relatively new Shapeways factory in Long Island City, NY. It was great to finally be able to see where our products are 3D printed. When we first started working with Shapeways, they were based exclusively in Eindhoven in the Netherlands. About a year ago, they opened up their first manufacturing facility in the USA. Duann Scott, designer evangelist at Shapeways and all around awesome guy, showed us around. Since not all of you can make it to NYC for a tour, I figured I would post some photos and observations here. The factory is in a nondescript industrial building with no signage. After some stair climbing and hallway navigating we reach Shapeways. 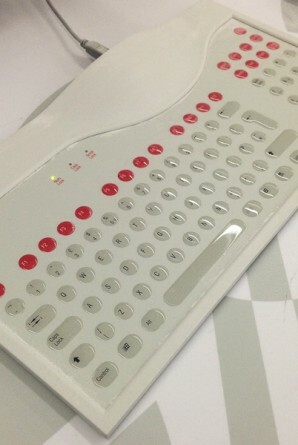 On first impression, everything is white. The floor is white, the walls are white, the machines are white, the 3D prints are white and to top it off a fine white powder of nylon coats every surface. The factory has three different 3 printing technologies on site: Selective Laser Sintering, full color zprinting, and multi-jet resin printing. I’ll describe their setup for all three processes. 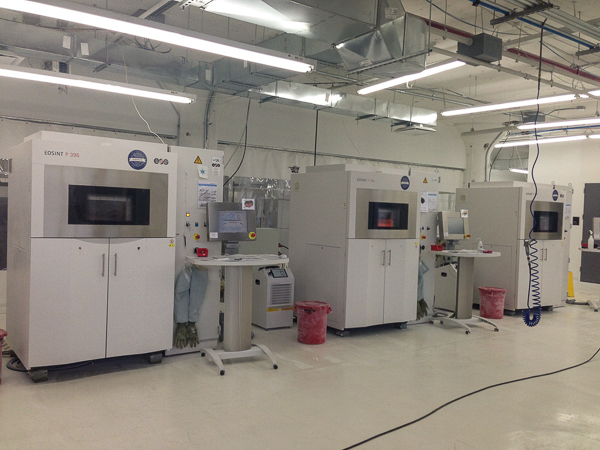 The Shapeways NY factory has a truly impressive number of EOS selective laser sintering printers at the factory. These are the machines that print all of the nylon (or “white strong and flexible” as Shapeways calls it) parts and thus a large proportion of everything we sell at Nervous System. They have two rooms of these machines. One with about 4 medium sized EOS SINT P 395‘s and one giant EOS SINT P 760. 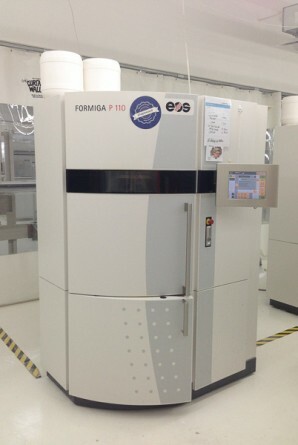 And another room of smaller sized EOS Formiga p110 machines. The smaller Formiga machines are the ones being used for Shapeways new fast turnaround time for orders of White Strong and Flexible models (ships in 6 business days) which explains why those quick ship times are limited to designs less than 20cm. 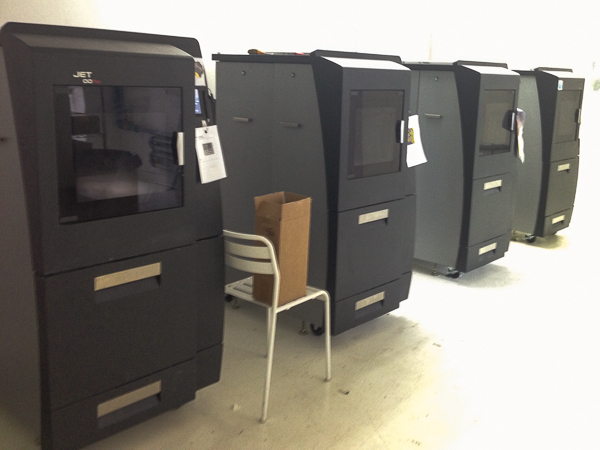 Considering that each one of these printers costs on the order of a half million dollars….that’s a lot of SLS machines! Correspondingly, a lot of man hours seems to go into planning the print jobs for those machines. Orders from many customers are painstakingly and efficiently packed into the build volume of each machine. We were told that printing a full build on one of the EOS SINT P 395’s takes around 36 hours and up to 48 hours on the P 760. During the week, they tend to run smaller builds on the machines that take around 12 hours each. During the sinter process, the nylon powder is heated to just below melting point in the build chamber. That means there is less thermal shock when the laser selectively sinters the 3d print. But it also means that after printing each build has to cool down for the same number of hours as 3d print time. So when they print a 36 hour job, it has to cool for 36 hours. When you take into account the scarcity of printers, print time, cooling time, and then man hours to depowder and do quality control on the prints – I start thinking that 6 day turn around time is quite impressive. It’s hard to imagine them being able to do it much faster without dramatically raising prices to account for inefficient use of the build volume. After cooling, the nylon parts go through 3 stages of depowdering including a round of bead blasting. If parts have been ordered in a polished finish, they are then added to a giant rotary tumbler with cylindrical ceramic media and a mild alkaline solution. After polishing, nylon parts are colored in acid dye baths in stainless steel kitchen pots on hot plates. 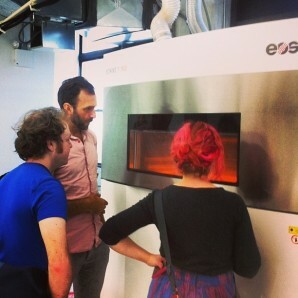 The resin 3d-printers live in a room isolated from the nylon dust of the SLS machines. They appeared to have 4 or 5 Projet 3000 machines from 3D systems. These machines work by jetting two materials, a clear plastic resin and a wax support that is cured with UV light. Shapeways uses them to produce their FUD (frosted ultra detail) material. It seemed like the majority of parts being printed on these machines were very small (size of my fingertip) scale models. After printing, the plastic parts are embedded in a block of wax support material. To remove the parts, the blocks are heated in a kiln to about 68 C/ 150 F and then cleaned in an ultrasonic bath. They use tea strainers to hold the parts in the bath, but it still seems like it must be very hard to keep track of all the minuscule parts through the various cleaning and checking operations. 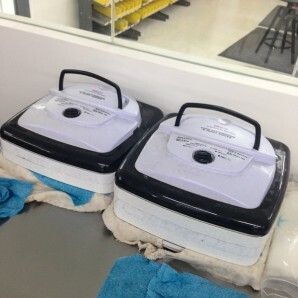 At the end of the process, they dry the parts in a beef jerky dehydrator (not kidding). In yet another room isolated from the nylon dust, Shapeways NY has a single Projet 660 full color powder printer from 3D systems. 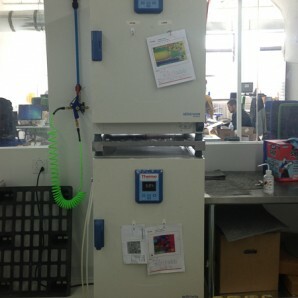 This machine works off the inkjet-inspired process developed by Z Corp that binds white plaster powder by printing colored glue. The process can produce photo-realistic parts. In one room, they have the printer, a depowdering station and an infiltration station. When parts come out of the machine, they are quite fragile and must be infiltrated with a cyanoacrylate (super glue) solution to strengthen the parts. The Shapeways LIC factory seems to have grown tremendously in it’s first year of operation. I was impressed to hear that all US orders of nylon prints are currently being produced there. That’s a huge step forward from a year ago when parts were being made at the Einhoven factory or being outsourced to other companies. The facility seemed well organized, with plenty of room for expansion should more machines be necessary. It seems like the main areas of difficulty are planning out printer builds (how to pack hundreds of designs from different people’s orders) and how to track the produced parts through quality control and shipping. Is anyone working on a good packing algorithm for 3d models? What about using computer vision to identify and check 3D prints? I’m sure Shapeways would pay well for that technology. Thanks for showing us around Duann! 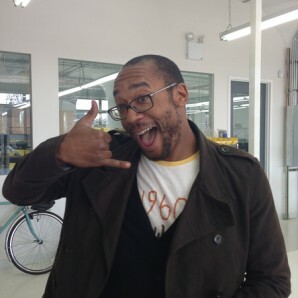 And a special hi to our customer service rep at Shapeways, Gary! Very cool. Thanks for the walkthrough and the photos. It’s great to see where prints are made, and to learn more about the technical details of the process.